Is this your old school? 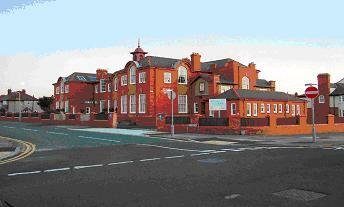 In 1974 Hoylake changed from being a part of Cheshire to become part of Merseyside and many of the official records of the early years of the school have been lost. We are hoping that within the local community there may be family records and particularly photographs of the earlier years of the school, its staff and pupils which may be loaned. Perhaps you have a relative who attended the school and who has an amusing story to tell of his or her time there? If you do or have any photographs or memorabilia please let us know. In the opening years of the last century a substantial red brick building arose among the sandhills facing the Hoylake promenade. 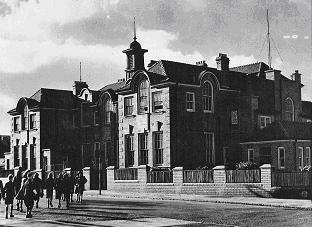 Work was completed in 1909 and on Monday 10th January 1910 the doors were opened on what was to be known as The Parade Higher Elementary School, Hoylake, Cheshire. Admission was limited to scholars twelve years of age and the school fee was 6d, (2p) and all scholars were required to pass an entrance exam before admission. The Headmaster appointed was Mr Humphrey Lewis F.G.S., master of Llangollen Council School. So began a new chapter in local education in a school where, for the next sixty years generations of children would receive the major part of their education. In 1973 Hilbre School (Newton, West Kirby) was opened, as co-educational school for boys as well as girls and the Parade School became an annex of Hilbre School. Within a short time all scholastic activity was moved to the main site in Newton, West Kirby. It was then the turn of West Kirby Grammar School for girls to find a use for the Parade site as an additional site for girls in the first years of their education. In the early 1980s the Grammar School no longer needed the site and it was used for a number of purposes including a base for Hoylake Youth Club after both the Y.M.C.A. and Parade School prefab in Deneshey Road were in turn sold. A school for children with learning difficulties was also moved to Hoyle Road and this gave us the name for the Sanderlings Unit in the old Housecraft building. The numerous rooms in the Parade also became a dumping ground for unwanted school furniture and the building quickly deteriorated. With the restricted use of the building the local authority made numerous concerted efforts to sell the whole site for housing. However they reckoned without the anger and determination of local people who were fed up with the sale of various local amenities. One of the claims of Wirral Borough Council, its officers and councillors was that the Parade buildings were near to the end of their useful life and would probably fall down if they werent knocked down. They had much to thank local people for in opposing the sale for within weeks the roof had been dislodged on Blackhorse Hill Junior School and the staff and pupils had to be temporarily housed in the Parade buildings. Thanks initially to a steering committee followed by the continued efforts and dedication of the Joint Management Committee the former school buildings have been turned into the thriving Community Centre it is today.